It happens too fast. It happens before I am even ready to begin to get ready. It happens in the blink of an eye. I wait all winter, through the dark days and early dusks. Every cold, icy morning as I leave the house, I look with longing at the barren branches of the lilacs. When the dawn is barely breaking on cold February mornings, I peer so closely at the tips of the silvery branches, sure that I can see the infinitesimal swellings of the buds. As the weeks slowly pass by, and the sun begins to linger more lovingly in the evening sky, I start to really yearn for those lilac blooms. I imagine the heady purple scent, the warm breezes, the grass below the feet of the healthy plants. It seems to me that the sight of those beautiful blossoms will bring me back to life after my long winter hibernation. And spring inevitably arrives, with the pebbly snow mounds melting away, the robins arriving, the daffodils emerging from the frozen ground. I watch it all, but I wait for the lilac blossoms. The sun gets warmer, the kids put on shorts and come to school with their summer buzz cuts. The peonies push up, the irises arise, the daisies spread out. We mow the grass and breathe in the perfumed air. We clean the grill and wash the windows and put the snow shovels into the shed. And still, I wait for the delicate, glorious clusters of lilac blooms to open and bow and send out that crazy, too sweet smell. Each day for at least two weeks, I watch each tiny bud on each lilac cluster, waiting for the first little gem to open its eyes and start to sing. At last, at last; the lilac blooms. The air is almost too intense; the sweet purple scent mixes with the hundreds of lily-of-the-valley that cluster along our walk. The sun comes out and warms the grass, the woods, the flowers themselves. The lilac have bloomed, and spring is really here. I sigh in delight. And then, in what seems like only hours, but what is really days, the blossoms fade and turn brown and fall to the ground. They have been and gone. And so the metaphor is clear, obvious to even the most obtuse. So often in life, we wait and wait and hope for something that isn’t here. We yearn for something just a little bit sweeter than what we have before us. We convince ourselves that this one little pleasure will make everything just right. And then it comes to us, and bursts into being. But before we can catch it or name it or breath it in the way we were always sure we would, it has passed us by, and we are back in yearning mode again. Like childhood, like new love, like a vacation on the beach, the lilacs come and go before we are even ready to get ready to capture them. Poetic. We magically have a lilac tree in our backyard (this is our first spring here) and it reminds me of being a kid. I don’t know how to care for it though! I don’t know where “here” is for you, but in new england, you don’t have to really care for them at all! They are native, and they thrive. I just cut off the dead blossoms (too soon!) and every few years I cut down the biggest stems so that the bush stays thick and lush. Good luck, and enjoy; what a glorious plant!! Here is Ontario, Canada and I’d assume it’s the same then. Which is great news for me because I am a laaaaame gardener. Honestly I had the same thought today! I have lilac outside my front door. They bloomed, it rained and they are gone, I don’t think it was more than about 10 days. The rest of the year they are a rather ugly plant. Great post. I know, I know….but it doesn’t smell as good….! A lovely and thoughtful post, as usual. Another one to put in your book of essays. And why don’t you have a weekly newspaper column? 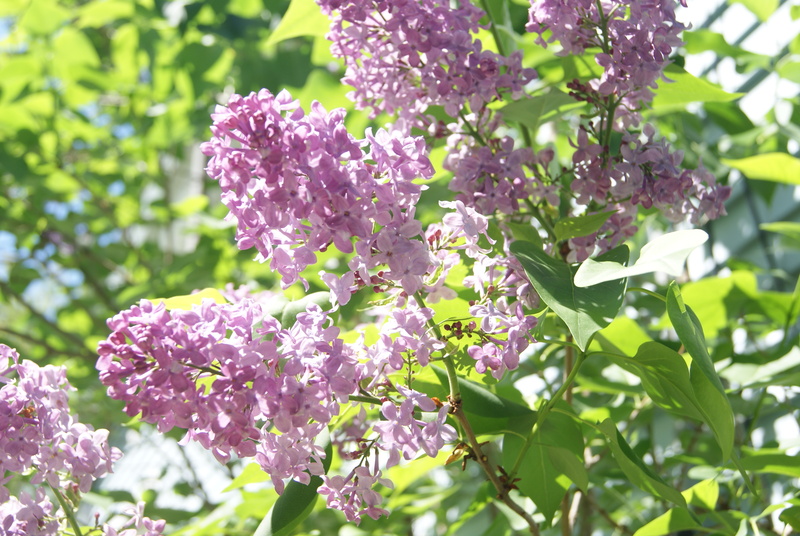 What is it about lilacs and their scent? They have always been my favorite too. I have a house in New Hampshire I will be retiring to eventually, and my first thought when I bought it was about all the lilac bushes I am going to plant. I have been taking the little “baby” offshoots and planting them around my property. I love to stumble across old, overgrown lilacs in the middle of a field, or the edge of the woods; you know that once a home stood there, and that only the lilacs are left. And thank you, as always for your super kind words! I’d love to write a column some day! One year I was back east when the lilacs were blooming at John and Abigail Adams’ house in Quincy. It was just gorgeous. I have one bush at my house outside San Francisco. I get a few measly sprigs every year, and the scent isn’t very strong. It doesn’t get cold enough here.